We are less than two weeks away from Selection Sunday and we are on the verge of The Madness taking full control of the national sports betting scene. But while two weeks really seems like a short amount of time, I can say for certain that there is still a lot of basketball to be played and there is a lot yet to be decided with regards to the NCAA Tournament field and NCAA Tournament projections. Right now I think that there are 19 leagues that will win only one automatic bid to The Big Dance. I also think that there are 35 just no-doubt teams (teams like Syracuse, Kansas and Duke) that have already secured their invitation. That means that 54 of the 68 slots are accounted for. It also means that there are 14 positions still available and, by my count, there are really only about 20 teams with a realistic shot at those final spots. Utah State, Butler, Gonzaga and George Mason are all solid favorites to win their respective conference tournaments. If they don’t then I think they are squarely on the bubble. Then the other true “bubble” teams are Old Dominion, Alabama, Georgia, USC, Washington State, Michigan State, Minnesota, Penn State, Michigan, Cincinnati, Baylor, Oklahoma State, Colorado, Clemson, Richmond and Virginia Tech. Obviously, some of those teams have stronger resumes than the others. And some of them can punch a ticket within the next 48 or 72 hours by simply winning another game or two. But in my mind these teams are the ones scrambling for a shot at making the field. And more than likely the teams involved in the new play-in games on the Tuesday before the REAL Tournament begins will come from the list above. Skinny: I think that Richmond still has some work to do but will find their way into the dance. They still have a big trump card from the nonconference: a win over Purdue. Duquesne has played its way out of the Big Dance after losing five of six. With no nonconference wins to speak of this team is headed for the NIT unless it wins the A-10 Tournament. Skinny: I know that everyone just assumes that Virginia Tech is in because they beat Duke on national television last Saturday. I am not willing to make that leap and just completely overlook yet another garbage nonconference slate for the Hokies. That said, I do still think they will find their way in. Clemson has two remaining games: at Duke and at home against Virginia Tech. They need to win one if not both of those games and then take a couple ACC Tournament games to break back into the discussion. I think the ACC is only getting four though. Skinny: Kansas State just punched its ticket Monday with a huge win over Texas. 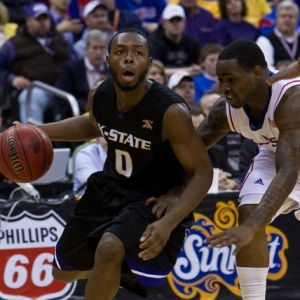 (And for the record, I love it that Jacob Pullen said he wouldn’t play in the NIT.) I think that if Baylor is banking on a sweep of Texas A&M to punch its ticket they are sorely mistaken; their resume is weak. In fact, I don’t see a scenario where Baylor, Ok. State or Colorado earns an invite unless one of them goes on a killer run in the Big 12 Tournament. Skinny: I think that the top nine teams are pretty self-explanatory. I also think that Marquette is clearly a tournament team. They don’t have any bad losses, played a great schedule, and have wins over Notre Dame, Syracuse and Connecticut. They are in. Cincinnati still has work to do, in my opinion. Their nonconference schedule was ranked No. 335 (of 345 teams) and their best non-league win was over Xavier. But beating Georgetown – which they only accomplished because Chris Wright broke his hand – could be the clincher, along with wins over St. John’s and Louisville. They play at Marquette and then host Georgetown. If they split they should be in. If they lose both and then lose early in the Big East tourney I don’t see how they can be in the field of 68. Skinny: Penn State can punch its ticket by beating Ohio State on Tuesday. Other than that they are an interesting case. I had Michigan State and Minnesota projected in the field in my last prediction. But I really don’t see how the Gophers can expect to be dancing. They have lost seven of eight and their one win in the last month came against Iowa. The thing is, they still have wins over Purdue, North Carolina and West Virginia. However, that was several player defections ago. They are a real X-factor. Michigan State needs to sweep its final two games against Iowa and at rival Michigan, and then they need to win at least one (and probably two) games in the Big Ten Tournament. I will say this: for being the alleged top conference in college basketball this league sure has a bunch of feeble resumes. Wait, stop me if you’ve heard this one: the Big Ten is AGAIN overrated. Skinny: George Mason has won 15 straight and I think as long as they beat up whichever bottom feeder they play in the quarterfinals they will punch their ticket. Their nonconference resume is pretty weak. However, they are 23-3 since Thanksgiving and have some name cache. But they will want to make the CAA Finals to be sure. Old Dominion actually has a solid resume. They have wins over Clemson, Xavier, Richmond and Dayton in the nonconference and they split with Mason. They won their Bracket Buster by a blowout over Cleveland State and I think they are in. Skinny: I think that the Horizon League and the WAC are the two conferences to keep an eye on because they are two places where bids can be stolen. Butler has won seven straight, earned a tie for the Horizon regular season crown, has wins over Florida State and Washington State and they have name cache. They also only have to win one game to get into the league championship game. And if No. 1 seed UW-Milwaukee losses to Cleveland State then Butler will host the title game. So things have lined up for them to make a return trip. I think they lose the conference tournament (to either Valparaiso or Cleveland State) but they earn an at-large bid. Skinny: New Mexico can put itself back in the discussion if they can sweep BYU. But that probably won’t be enough and they are headed to the NIT. Air Force drove a stake through the heart of Colorado State’s hopes on Saturday so they don’t even warrant consideration. UNLV is a lock. They have wins over Wisconsin, Kansas State and Virginia Tech to go along with a quality overall resume. Skinny: I never thought I’d say this: but I think that the Pac-10 could end up getting five bids. With the Big 12 and Big Ten bubble teams floundering that is keeping the door open for some of these Pac-10 and SEC clubs. I don’t know if anyone had a better two weeks than USC. That fraud Joe Lunardi hasn’t given a hint of respect to the Trojans – or Wazzou for that matter – and I am sure it has something to do with the Pac-10 being aligned with Fox. But USC blew out Texas by 17 and also beat Tennessee on the road. They have wins over Arizona and UCLA and came up two points short at Kansas. If they can split in Washington next week against the Cougars and Huskies I can’t think of a reason why this team shouldn’t be in the field. Washington State now has a sweep of Washington to go along with wins over bellow bubble teams Baylor and Gonzaga. Their nonconference resume beyond that isn’t all that strong though. This team has home games against USC and UCLA. Again, if they can get a split and then win a game in the Pac-10 Tournament I think that they will find themselves in one of the play-in games. Skinny: Again, I know that it doesn’t make any sense that the SEC would get this many teams. But I think that they will. They could get six teams, but I think the Georgia-Alabama game in Tuscaloosa this Saturday will essentially be a playoff game. I think the winner gets in and the loser could get in with a win or two in the SEC Tournament. I know that Georgia seems like a flimsy pick, but they beat Kentucky, Tennessee and fellow bubbler Colorado. Also, they don’t have a single bad loss and they have a resume comparable to a Marquette. Alabama just doesn’t have the nonconference resume. I think they need the Georgia win most, along with a win in the SEC tournament. Skinny: Again, I think if anyone has benefited from the mediocrity in the Big 12 and Big Ten it is Gonzaga and St. Mary’s. Remember: Gonzaga has beaten Marquette, Baylor, Xavier and Oklahoma State – all fellow bubble teams. They won the WCC regular season and if they can make the finals of the league tourney I think they will be impossible to deny. St. Mary’s has had a horrific two weeks. I think they have to win the WCC Tournament in order to claim a bid. But the thing is, I think that is exactly what they will do. I am projecting two teams from this league. Skinny: Utah State could lose its conference tournament. I doubt they will. But it is conceivable. And if they do lose they will earn an automatic berth. *Denotes a team I think will make the NCAA Tournament. Right now I only have 67 teams in there. You pick the 68th. I think right now it comes down to one of the three Big 12 teams, Penn State, Cincinnati, or Colorado State. But honestly: who cares at that point. Robert Ferringo keeps proving himself to be one of the best college basketball handicappers in the nation. His college basketball picks have earned $100 bettors nearly $7,000 in the last two months. Another strong card is coming on Tuesday and you can get his pick HERE for only $30.